Bitcoin and other cryptocurrencies continue to weather attacks from Internet giants. 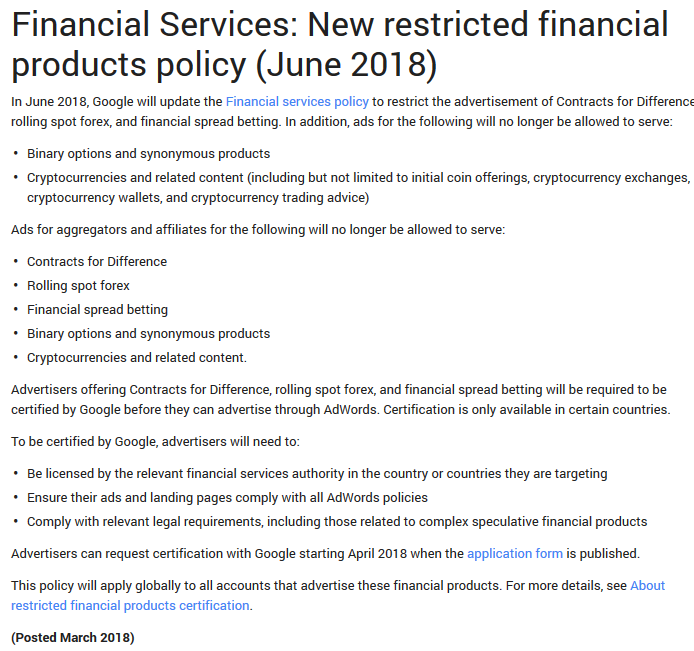 The most recent nemesis is Google’s update to their Crypto Financial Services Policies. 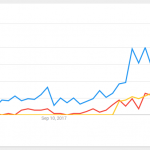 The world’s largest search provider will no longer permit ads related to cryptocurrency on its various platforms beginning in June of 2018. Google joins Facebook and Twitter which have previously announced similar bans. Following the Bitcoin boom of late 2017, cryptocurrencies have faced increased scrutiny on multiple fronts. The decentralized nature of digital assets, some claim, leads to deceptive promotional efforts. Advocates of the ban point to ICOs, or Initial Coin Offerings, as unregulated forms of fund raising that can be used to defraud the public. In April 2018 the founders of Centra Tech were charged with securities and wire fraud after investigators claimed the company had made false promises regarding its ability to provide a cryptocurrency-based debit card. The Google ban on cryptocurrency advertising will affect all of the company’s ad platforms. This means that individuals or companies will not be able to place ads on websites with Google AdWords, and it also means that Google AdSense users will no longer see cryptocurrency ads served to their websites. Google’s Director of Sustainable Ads, Scott Spencer, believes that the company’s decision reflects what Google has observed to date from companies that promote ICOs. Spencer has left open the possibility that Google will rescind or amend the ban at some point in the future, but this will likely require more oversight and regulatory measures for digital tokens. The ban includes advertisements for ICOs, cryptocurrency investment advice, cryptocurrency wallets, and financial exchanges which permit individuals to trade one digital asset against another. Other countries have also seen a reduction in the number of crypto ads which are appearing on social media platforms. In particular, China seems to be cracking down on crypto advertising as part of a broader agenda which includes a nationwide ban on cryptocurrency exchanges. The country also no longer permits participation in ICOs. Is your business effected by the Google AdWords (PPC) Pay Per Click Advertising ban? 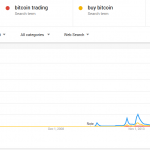 Find out how our crypto SEO services can take the place of paid ads in your display and search marketing strategies and deliver a better ROI. Contact Crypto Visibility today to learn about our blockchain and crypto marketing service.